After finishing second to JR Norris at Montgomery Motor Speedway last month, veteran racer Charlie Bradberry knew that with just a few minor tweaks, his #78 Veterans Oil Super Late Model would be tough to beat when he returned to the half-mile track on Saturday night. That looked to be quite true as well as the day progressed. Bradberry topped the other 19 cars in attendance to pick up the pole for the night’s event. When the green flew, Bradberry jumped out to the lead until Jason Hogan passed him on lap eight. Charlie spun and hit the turn three wall. Hamner also slid up the track, but was able to keep his car off of the wall. “I saw Josh had a run on me,” added Charlie. “At that point in the race, there was no reason to race hard. I saw him get a run on me and I guess he misjudged. He took us out. “I had a brain fart. That is all there is to it,” said Hamner of the incident with his friend. “My car was really good getting into the corner. And it looked like Charlie had to check up getting in. I knew (Jason) Hogan was coming. We still had to pit and I needed to be in front of Charlie for that. I got into him just a little bit, but he was also loose it looked like, so it didn’t take much of a bump to send him around. I hate it. 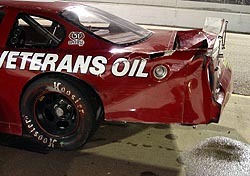 Even though it didn't look like a hard hit, Charlie's car showed heavy damage. Even red from the wall rubbed off on his left rear tire. repairs, but the team parked it just a few laps later because of the extensive damage. He finished 16th. “I think our strategy (of pitting late) would have worked. This place is hard on tires. With 20- or 30-lap fresher tires than Hogan, I think we could have run them down. I felt like whoever had fresher tires would have had it. During pre-race ceremonies on Saturday night, Montgomery Motor Speedway track officials honored the three original members of the Alabama Gang in a special ceremony. For a while, it looked as it Jason Hogan was going to run away with the later stages of the race on Saturday night. Ken McFarland (and a late caution flag) made sure Hogan wouldn’t. The late caution put McFarland right on Hogan’s bumper with just seven to go. McFarland got a good jump, stayed with Hogan for a few laps, just tapping Hogan’s bumper, letting him know he was there and hoping that he’d make a mistake. Unfortunately, a little slipup from McFarland off turn two let Hogan get some distance and McFarland had to settle for second. 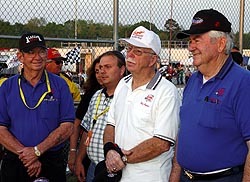 Donnie Allison (l-r), Red Farmer and Bobby Allison were honored before the race. McFarland hounded Hogan, but never rooted him out of the way. It was a good finish for McFarland, who was the only other driver to lead a bunch of laps besides Hogan. “We got the lead early, then, later in that run, the car got tight on us. We came in and put our tires on and the car came back to us. The car was really, really good. It was good in early runs. McFarland led for 31 laps. The “undercard” Pro Late Models had a wild night on Saturday, despite having only 10 cars in the field. Bradberry just sat back and rode around fourth, biding time while the rest of the drivers used up their equipment, setting a torrid pace. Bradberry reassumed the lead at lap 71 when he stayed on the track as the rest of the leaders came in to pit. The team hadn’t planned to pit until around lap 90. Things took a turn for the worse on lap 79, as Bradberry got a bump from behind by second-place Josh Hamner. It appeared that Hamner was going to make a pass on Bradberry, but realized that he didn’t have the lane. Hamner got on the brakes, evident by how quickly the nose of his #38 went down, but his momentum carried him into Bradberry. The two made just the slightest of contact, but it was enough to turn Bradberry around. Bobby Allison, Donnie Allison and Red Farmer were all presented with special plaques and honorary trophies in front of the sold-out crowd. “I’m so glad to see that someone has come here and taken this track and is taking it back to a way it once was when all of us raced here,” said Donnie Allison. “This was a legendary place for us and this is a track that holds a lot of great memories for me and I’m sure all of us standing up here. The speedway will eventually erect a full-size monument behind the grandstands, but an exorbitant amount of rain in the recent weeks has kept the track from starting construction. However, in post-race tech, Reno’s car was found to be illegal. 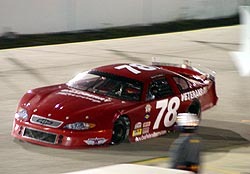 He was disqualified and the win was then given to the second-place finish of Frank King. 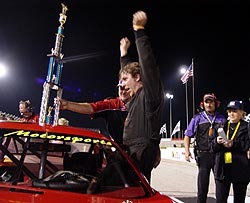 However, King’s car was also found to be illegal and he was disqualified as well, handing the win to the initial third-place finisher, Bill Bethea III. 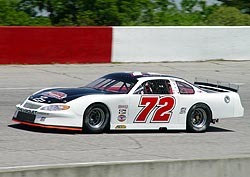 Ted Musgrave Jr. has now made both trips to Montgomery Motor Speedway for the track’s Super Late Model Series. Dennis Reno Jr. was actually stuck in his car for a while, then finally climbed out to what he thought was a win. He was later diqualified. The race proved hard on equipment, as two of the early favorites, DuWayne Middlebrooks and Hunter Robbins, both fell out of the event with engine problems. 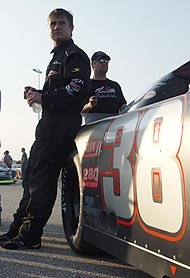 Gregory Tallent, the only driver to pull double-duty by racing in both the Pro Late Models and Super Late Models, then fell out with mechanical problems. Then came the finish. While on paper, it looked like a runaway win for Dennis Reno Jr., it would later prove different. In Victory Lane, Reno celebrated the win with the crowd. But, initially, he did it in his car. Why? Because the steering wheel was stuck. He couldn’t pop it off and therefore, he couldn’t get out of the car. Several crew members tried to help him to no avail. Finally, nearly five minutes after pulling into Victory Lane, Reno took the steering wheel off of the steering shaft with a wrench and climbed from the car. Last time he finished just outside the top five in sixth. This time around, he wasn’t going to be denied a top-five. Instead, he came up with a podium finish. “We only had eight laps of practice,” said Musgrave, who came home third. “That is all we did. We went out there today with the tires that we ran last week at Concord. I said the car was good, ‘so lets put he car on jack stands.’ So I went out there to qualify and the left rear valve core stuck. I went over there and qualified seventh on a nearly flat tire. “So we just rode around and took our time come race time. We were down a man tonight. I didn’t have enough people to work on the car, so we couldn’t put gas in the car, which I needed near the end of the night. I was out there smoking the tires. 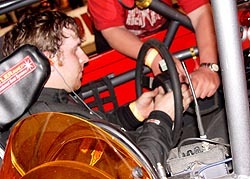 A lot of racecar drivers prepare for races in different ways. Some like to be left alone; they sit by themselves and think of the upcoming race. Others like to rock out with loud music to psych themselves up. Others are superstitious and eat something particular before an event. Well, 17-year-old Josh Hamner likes to take college entrance exams. Not really, but that was the case this past weekend, as Hamner double-dipped on Saturday. In the morning, Hamner spent four hours taking the ACT test, which is one of two standardized tests that help colleges determine student’s academic knowledge. 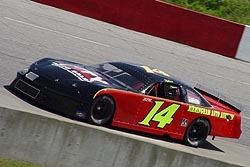 In the afternoon, Hamner was on the fast track to Montgomery Motor Speedway, where he competed in the 125-lap Super Late Model event that evening. 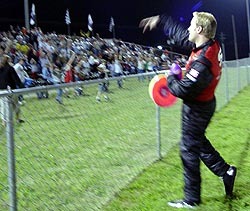 Charlie Bradberry throws some footballs into the stands during prerace intros. With Montgomery Motor Speedway just recently coming back into prominence, there was a question as to how the locals would react. Also, would bring the Super Late Models coming back to the track draw fans and competitors? Well, in Saturday night was any indication, then things are looking good. For the second-straight race, the track had a sell-out crowd. While the crowd wasn’t as big as the first race of the year, where it was literally “standing room only,” it was still a sell out none the less. The track will try to make it three sell-outs in a row when Montgomery returns on April 23rd with a 75-lap race Pro Late Model (two-barrel carbs) race paying $2,000 to win. The Super Stocks and Pure Stocks will also be in action, along with the first showing of 2005 for the Mini-Sportsman. And while his test results won’t be known for several weeks, his racing results came back with a fourth-place finish. “It was an interesting and very long day,” said Hamner. “Those are two totally different worlds there, from sitting in a classroom with the utmost silence around you for four hours taking a test to sitting in a loud racecar for a couple of hours driving at high speeds and the sound of your car and other cars buzzing in your ear. this year. So has he taken anything from the Pros to the Supers?